Ikinari Musician was developed by Musical Plan for the Famicom and published by Tokyo Shoseki in 1987. 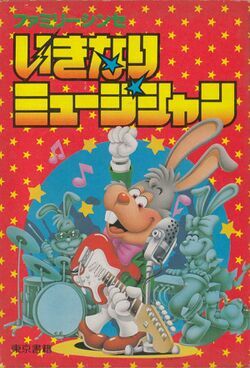 The full Japanese title of the game translates as "Family Synthesize - Spontaneous Musician." It is not really a game, but rather a music simulator. The player can select the back ground music from a selection of geographical locations famous for particular genres of music, including five in Japan. The player can also change settings like musical instruments and visual effects, while notes are played on the keyboard at the bottom. Sequences can be recorded and played back. This page was last edited on 13 May 2009, at 02:02.